Please don’t hesitate to call with any questions. We offer Free Consultations! Identify and Discover the True You! The Temperament Types listed below are pure Temperament Types. Uniquely only a few of us have pure Temperament Types. The majority of us have blended Temperaments! Our Temperaments remain with us throughout our lives. Discover Yours! Melancholy characterized by a need to be alone. They are independent, realistic, artistic, and creative. They also tend to be thinkers. In the area of Inclusion, the Melancholy has some very definite strengths which, when controlled, cancause the Melancholy to do many great and wonderful things. These strengths include: introvert, loner,great thinker, genius-prone, very artistic and creative, often found alone in thought, perfectionistic, slow-paced, great understanding of tasks and systems, a critical and challenging mind, and seeing both the pitfalls and the end results of a project undertaken. You can see that once these strengths are brought under the ordinances of God, the Melancholy in Inclusion is capable of great things. When the Melancholy sinks to their weaknesses, the following will happen: they become extremely moody, suffer from “black” depressions, reject people, set standards neither they nor anyone else can meet, develop habits that are very hard to break, have suicidal tendencies, low self-esteem and are pessimistic. 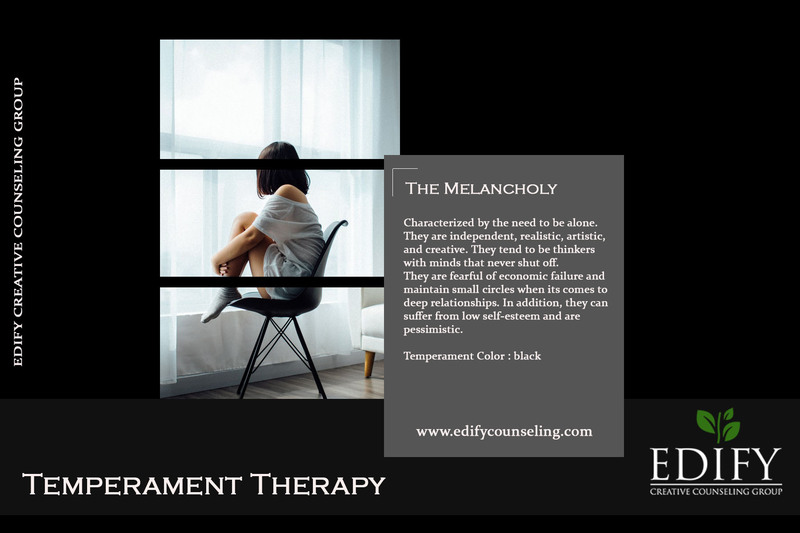 Therefore, when the Melancholy sinks to their weaknesses, they can be destructive to themselves and others. The Melancholy has a fear of economic failure that prevents them from going forward. This can also be a strength in that they are thrifty and live within their means. Sanguine characterized by their need for people. They are bright, cheerful people who are like sunshine. They are attracted to colorful things and a heightened sense of smell. In the temperament area of Inclusion, the Sanguine has some very definite strengths. 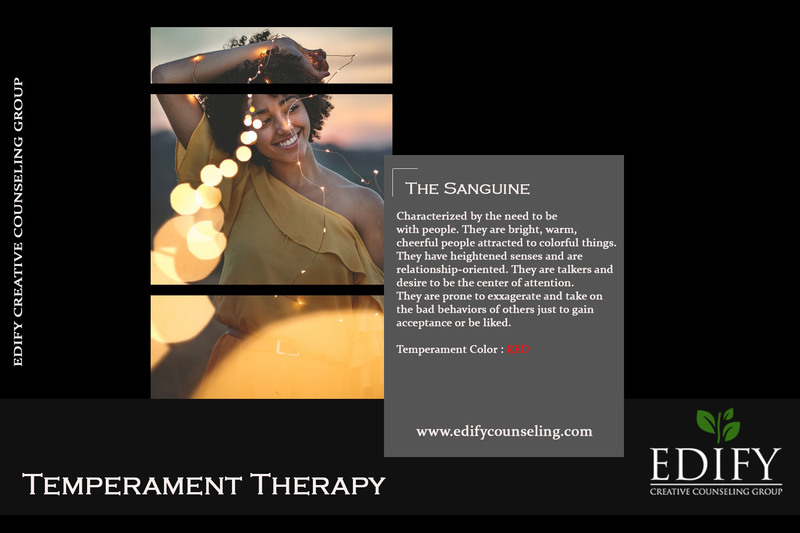 The temperament strengths of the Sanguine include: being friendly, outgoing, inspiring to others, relationship oriented, enthusiastic, warm, optimistic, ability to see the bright side of life and the good in other people. They genuinely like people, are rarely found alone, and freely interact with people. When looking at these strengths, you can see the potential for achieving great accomplishments. The weaknesses of a Sanguine in Inclusion are those that can become very destructive to the Sanguine,both emotionally and spiritually. These include: being talkative, always the center of the conversation,apt to take on the behavior and morals of the people around them, impulsive, undisciplined, rude, prone to exaggerate, need to appear successful (even to the point of exaggeration), will ignore responsibilities in order to be with people. Choleric characterized by a need to dominate/control situations, self, and others. Also, have leadership capabilities. 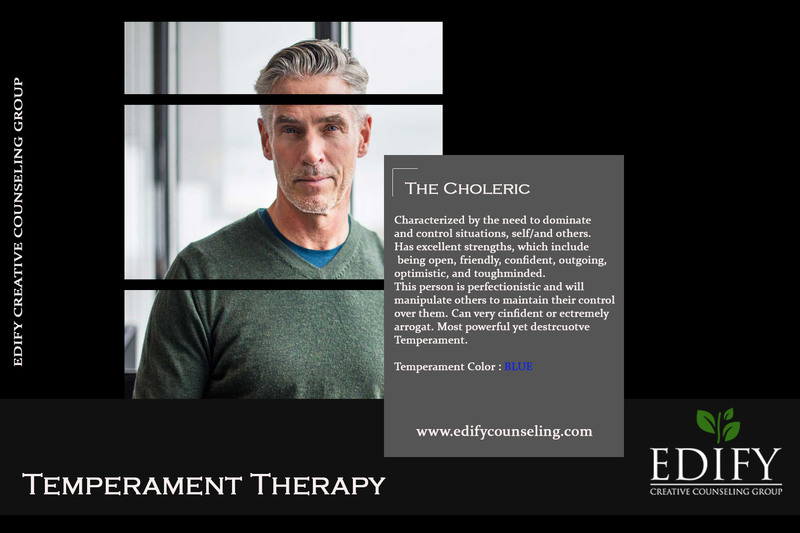 In the temperament area of Inclusion the Choleric has some excellent strengths, which include being open, friendly, confident, outgoing, optimistic, and toughminded. This person is perfectionistic and has a good mind for envisioning new projects and is an extrovert of a highly selective nature. In the temperament area of Inclusion, the Choleric also has some weaknesses. They are often hot- tempered and, although everyone uses people to some extent, the Choleric in Inclusion “carries the flag.”They are people users, however, they call themselves “people motivators.” In addition, because of being easily frustrated in their attempts to “motivate” people, they harbor anger and are sometimes cruel. The Choleric in Inclusion has another weakness which they view as a strength. They always dominate social conversations. They are not necessarily rude, just domineering in all social interaction. They control the social scene. The Choleric in Inclusion has a personable, almost arrogant manner in dealing with people and most of us would believe they are genuine in relating to people. However, the Choleric is a task oriented person. The real interaction the Choleric attempts to establish is for their driving need for accomplishments and recognition for their accomplishments. In the temperament area of Inclusion, Phlegmatic strengths include the ability to perform tedious tasks and to relate to both tasks and people. They are calm, easy-going, extremely efficient and perfectionist. 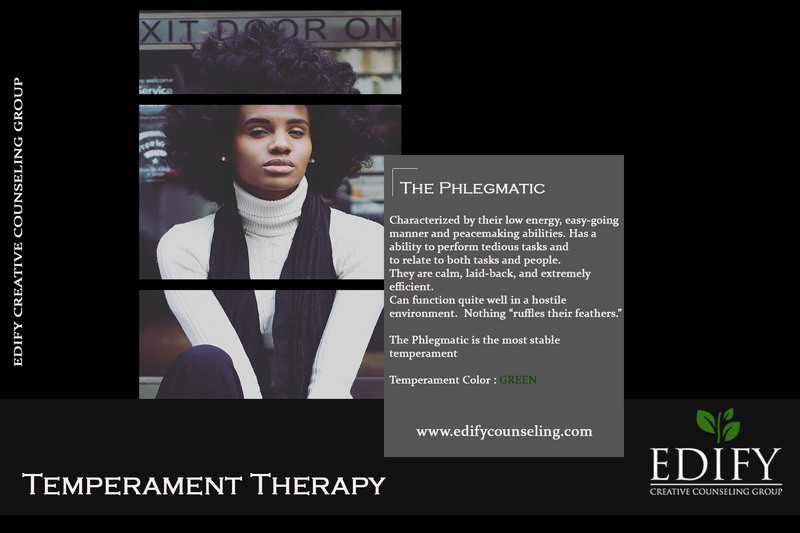 The Phlegmatic is the most stable temperament. They have no real problems with anger, rejection or destructive emotions like the other temperaments. They have no compulsive needs or wants and suffer very little from bitterness or un-forgiveness. The most damaging thing about the Phlegmatic is their stubborn resistance to change and their un-involvement in life. The Phlegmatic is the most stubborn of all temperaments when it comes to making changes. The harder you push them to make changes, the more stubborn they become in resisting these changes. To change takes energy; to stay the same does not. Therefore, the Phlegmatic will take the path of least resistance, which is to remain the same. Supine characterized by their indirect behaviors, inability to initiate, and their gentle spirit. They are also people-pleasers who feel their only purpose is to serve others. In the area of Inclusion, the Supine strengths include a great capacity for service, liking people, and the desire to serve others. They possess an inborn gentle spirit. The Supine in Inclusion is relationship-oriented and needs to relate to other people. They indicate temperament needs for social interaction, surface relationships and intellectual energies. The Supine in Inclusion is both introverted and extroverted. This means they express themselves as an introvert and respond as an extrovert. Because this person is quiet and usually found in the background in a social situation they appear to be distant and respond only when approached by others. They will not send messages that they want to be accepted nor do they assert themselves. They want others to guess their need to socialize. They are often frustrated in their loneliness, when other fail to anticipate their needs. The Supine in Inclusion does not relate to nor understand tasks as well as they do people. When at parties or social activities, you would never guess from outward signs that they desire to be included. If the people around the Supine do not interact with them with acute sensitivity, the Supine will forever remain in social isolation. 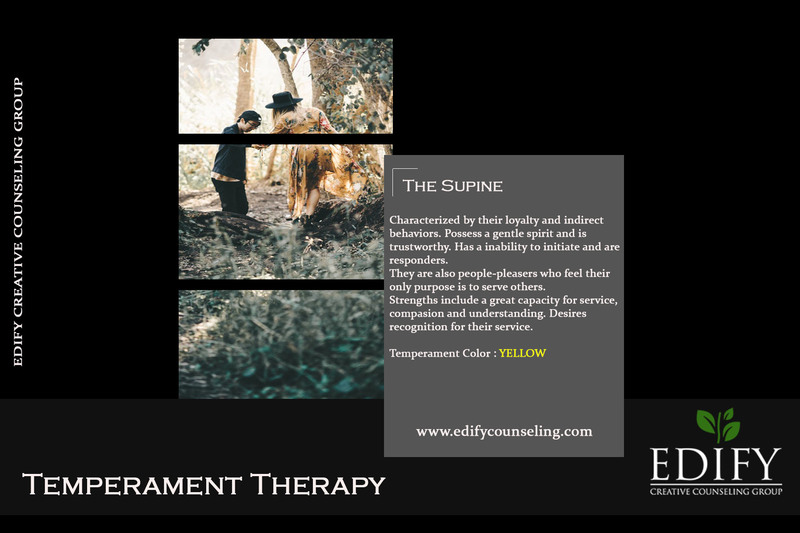 The Supine Temperament can undertake numerous tasks, especially if these tasks are performed for the development of friendships. A person with this type of temperament can be extremely accommodating to other people, even at their own expense. The need to serve others and make them happy, leads to their being natural born victims. In a “nutshell,” our Temperaments consist of three major areas, Inclusion, Control and Affection. In regards to relationships, Inclusion determines who is in or out of the relationship; Control determines who maintains the power and makes decisions for the relationship; and Affection determines how emotionally close or distant the relationship is. The Temperament areas of Inclusion, Control and Affection (emotional needs) must be balanced or our physical bodies will eventually break down. Inclusion is the need to establish and maintain a satisfactory, surface relationship with people through association and socialization. Relationships include parties, social gatherings and people who come in and out of our lives every day. The temperament need ranges from approaching many people for association(socializing, surface relationships) to approaching only a select few. The second Inclusion need is wanting people to approach us for association and socializing. This need is measured on a scale of wanting almost everyone to wanting almost no one to approach us for association. Terms used to describe this association are interact, mingle, belong, communicate, companion, attend,member, togetherness, join, extrovert, introvert, exclusion, isolate, outcast, outsider, lonely, detached, withdrawn, abandoned and ignored. InclusIon need #1 is the need to establish and maintain a satisfactory relationship with people in the area of surface relationships (association and socialization). InclusIon need #2 is our desire for wanting people to approach us for association andsocialization. Inclusion is unlike the temperament need of Affection in that it does not involve the strong emotional attachments to another person. Inclusion is unlike the temperament need of Control in that Inclusion concerns itself with the prominence of the social encounter. Control concerns itself with which of the participants in the interpersonal situation is dominant. The need a person is attempting to meet in the area of Inclusion is the perception of feeling significant or worthwhile. Control is the need to establish and maintain a satisfactory relationship with people in respect to control and power. This need will determine who needs to maintain control and hold the power in the interpersonal situation. The need for control within the temperament ranges from maintaining control overeveryone’s behavior to maintaining control over no one’s behavior. The second area of need within thetemperament is measured in wanting no one to control our behavior to wanting everyone to take control of our behavior. Control is the decision-making process between people and is described in such terms as power,authority, dominance, influence, control, ruler, superior, officer, leader, rebellion, resistance, follower,anarchy, submission and henpecked. Control Need #1 is the need to establish and maintain a satisfactory relationship with people in respect to control and power. Control Need #2 is the need within the temperament measured by wanting no one to control our behavior to wanting everyone to take control over our behavior. Control differs from Inclusion because Control is the need for dominance within the interpersonal situation, not prominence of the relationship, i.e., the power behind the throne. Control is different from Affection because it has to do with the need for power in the relationship rather than emotional closeness. The perception of feeling competent is the need objective in the area of Control. Affection is the need to establish and maintain a satisfactory relationship with others in regard to love and affection. The needs within the temperament range from showing love and affection to a great many people to showing love and affection to only a select few. The second area of need within the temperament ranges from wanting love and affection from everyone to wanting love and affection from no one. Affection is unique within the temperament because it can only occur one person to one person, whereas in the areas of Inclusion and Control a group of people can be combined to be associated with or controlled as one. The temperament need for intimacy can only be achieved by the close, personal, emotional feeling between two people. To become emotionally close to someone, requires an element ofconfiding innermost desires, anxieties and feelings. A strong emotional tie usually results through sharingfeelings. Affection Need #1 is the need to establish and maintain a relationship with others in regard to love and affection. Affection Need #2 is the need within the temperament measured by wanting love and affection from everyone to wanting love and affection from very few. The perception of feeling that “Self” is lovable is the need the person is attempting to meet in the area of Affection.